A recent review of Toby Hemenways' Gaia's Garden (Chelsea Green Publishing, White River Junction, VT, 2001) remarked on Hemenway's "friendly and muscular style." In person, decorous, attentive and gently spoken, his disarmingly modest manner hides one humdinger of an intellect, informed by an experience born of years transforming a clearcut in Southern Oregon into an edible food forest, and his work as associate editor of The Permaculture Activist, the de facto clearing house for permie factoids in the northern hemisphere. Rage is not the best emotion to be carrying into the garden. The advantages of perennials are legion. They eliminate seed-starting, tilling, and the opportunity for weeds that tilling brings. That makes three chores slashed off the list at one stroke. Perennials also need less water and fertilizer than annuals. Their deep root systems tap into pockets of moisture and nutrients that annuals just can't reach. Because they are year-round plants, perennials also offer dependable habitat to wildlife and beneficial insects. Fertility comes from flow. A more vigorous soil life heaves more nutrients into the flux for plants to divert, releasing excess fertility during the cycle from raw material to living body to waste and back again. 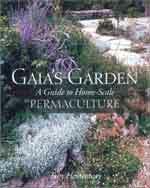 Here, as in so much of the ecological garden, the process, the activity, the relationship, is paramount. Healthy soil and plants are created not by the simple presence of nutrients and soil life, but by the briskness and depth of their flows and interconnections. Savvy gardeners know this, and will do all they can to feed the life of the soil. You can't fight nature - nature always bats last - but you can sometimes be the first to get where it's going. Want an insect-attracting, deer-proof, and edible flower with medicinal properties? Try bee balm (Monarda didyma). For a plant that yields salad greens and poultry forage, and has roots that break up clay soil and make a coffee substitute when roasted, use chicory (Cichorium intybus). How about a nitrogen-fixing shrub that is great for erosion-control and hedges, with edible berries that are packed with vitamin C? That would be sea buckthorn (Hippophae rhamnoides). The combinations can even be whimsical. At a recent workshop, one student listed twenty medicinal plants that could also be used for toilet paper. I believe that communities are held together by their interactions as well as by their environment. Also, by removing only a bit of the biomass, the larger cycles of the ecosystem remain more intact than if I hacked down a head of cabbage (to me, harvesting annuals is like small-scale clearcut logging). The perennial kale continues to offer habitat for food for bugs and birds, the roots harbor soil life, the leaves shade the soil, and so forth. That's a lot more than a stub of cut-off cabbage will provide. Food is one of the least compelling reasons to include native plants in the garden; their value for wildlife habitat and biodiversity preservation is far greater. Natives play an important role in the ecological garden, but share the landscape with many useful non-native plants. Formally defined, a guild is a harmoniously interwoven group of plants and animals, often centered around one major species, that benefits humans while creating habitat. Guilds are attempts to bridge the broad gap between conventional vegetable gardens and wildlife gardening by creating plant communities that act and feel like natural landscapes, but that include humans in their webwork. I believe that trees - as full, integrated partners, not merely as scattered specimens - are a prerequisite for a healthy, sustainable landscape.